When 30-year-old Kim Young-hoon started a new job at a tech firm in Pangyo this year, he decided on a practical investment: an electric scooter for his daily commute from his home in Seohyun-dong located about 5 kilometers away. After all, whizzing to work on electric scooters seemed to be the popular thing in Pangyo, a tech-savvy neighborhood south of Seoul known for its quickness to adopt new technologies and trends. Five months into scootering to work, Kim is beyond satisfied with his purchase and is convinced that e-scooters are the way to go for short-distance travel. “Unless it’s raining, I take my scooter (a Segway Ninebot ES2) to work every day, traveling on the bicycle paths in the parks stretching through Bundang,” Kim told The Korea Herald. Kim is just one of many South Koreans who view electric scooters as an effective way to commute to and from work or school. Together with recreational riders, e-mobility users like Kim are fueling the popularity of personal mobility devices, or PMDs, here. 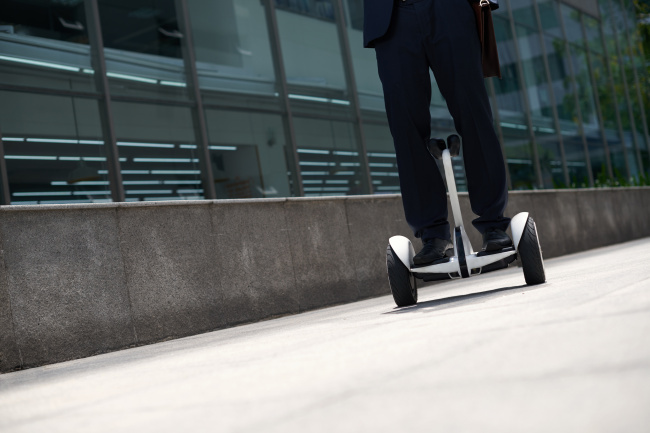 PMDs broadly refer to motorized, one-person vehicles powered by electricity, including standing electric scooters, two-wheeled Segways, hands-free hoverboards and electric bikes. Though varying by model, they can travel at a maximum speed of around 20 to 40 kilometers an hour. A standard e-scooter costs around 500,000 won ($450) at local retail prices. And demand for PMDs is growing quickly. According to the Korea Transport Institute, approximately 75,000 PMDs were sold here in 2017, up 20 percent from 60,000 units the previous year. By 2022, this number is expected to surpass 200,000 units, according to the institute. Though PMDs initially garnered interest as recreational devices in Korea, they are now perceived more as practical vehicles for commuting. According to a 2017 KTI survey of 150 personal mobility device users, 55.3 percent said they used PMDs as a means of commuting to work or school, exceeding those who were using them for recreational purposes (46.7 percent). Despite the growth, the regulations surrounding PMDs have been ambiguous, if not absent, leading to safety risks as well as widespread confusion among scooter riders, cars and pedestrians. In Korea, most people ride their e-scooters on sidewalks or in a bike lane when available. Many ride them at public parks. Most people do not wear helmets, and few can be seen riding in the streets. However, this is all illegal according to Korea’s transport regulations. The Road Traffic Act categorizes PMDs as motorbikes, treating them similar to a standard motorcycle. This means the legal way to ride a PMD here is to stay in regular car lanes and wear a helmet. The rider must also be over the age of 16 and hold a two-wheeled motor vehicle driving license. In reality, however, most e-mobility riders don’t follow these rules, largely because they are unaware. Enforcement has been weak as well, with surveillance mostly limited to sporadic inspections at Seoul parks. This legal stipulation itself is self-contradictory. While PMDs are required to travel within car lanes, there is no law mandating e-mobility devices obtain the governmental safety certification required of all vehicles on the roads. Legal issues aside, experts warn it is realistically dangerous to send e-scooter riders to the roads to travel next to regular cars that are going at much higher speeds. “Personal mobility devices are here and growing in scope, but the regulations are not keeping pace, hurting both the industry and PMD riding culture,” said Kim Pil-su, an automotive engineering professor at Daelim University and chairman of the Korea Electric Vehicle Association. In June 2017, local lawmakers proposed a revision to the Road Traffic Act to include legislation specific to personal mobility devices and the correct way to ride them. But the revision is still under consideration at the National Assembly. The regulatory gap is hurting efforts to create an improved riding environment for PMDs as well. The Seoul Metropolitan Government announced plans last year to build specialized paths for PMDs such as e-scooters and Segways in test beds in Seoul by the end of this year. However, the city has had to halt the project for now, as it is waiting until the related regulations are formalized, a Seoul City official confirmed. Under current circumstances, it is also difficult for Korea to accept dockless e-scooter sharing service models that are already popular overseas. It is a system where users can use an app to pay for, pick up and drop off any e-scooter distributed in an urban area. Startups pursuing this model, including Lime and Bird, currently operate in major cities in the US and Europe, though permit issues are being resolved in some locations. Lime and Bird have also been garnering interest from big tech investors, raising millions of dollars in funding from firms like Uber and Alphabet to secure a valuation of $1 billion or more.